It's a cold and rainy November day, but Joe Waters is wearing flip-flops, a t-shirt and jeans. He's a business owner, but he's a surfer through and through. And he's practical. "I'm on my feet all day. These are comfortable," he said, pointing to his leather Olukai footwear. "They're well-made." The spry 57-year-old Florence native has watched a few trends ebb and flow during his time, but Salty's Surf Shop has been going strong since the 1980s and shows no signs of fading into the sunset. It could be said that his future took shape early on at the Wisteria Drive home of his friend Tag Gandy, who had a nice. smooth concrete driveway. it was perfect for skateboarding. Joe and Tag would cruise around, mostly emulating Tag's older brother, Buddy. "He trailblazed everything for us," Waters said. Nose Wheelies and 360s are a far cry from today's skating moves, but the equipment was far different in those days- skinny boards and cay wheels. "Every day, I ventured over there," he said. "It wasn't competitive, just recreational. I just did it for fun." A basketball court gave Joe and Tag another opportunity to watch Bubby an copy his moves, and waters recalls plenty of traditional sports as well, like baseball and football. "An outdoor- type lifestyle," he said. Family trips to Garden City and Myrtle Beach for summer fun introduced water skiing and boating to his list of pursuits, and one summer along the Grand Strand solidified his love of the ocean. A Dewey Weber 'Pig' model surfboard purchased at age 12 from Ocean Surf Shop sealed the deal. Waters recalls several kids his age milling around the shop and watching him leave with it. On the beach, they asked him about the board. "Yeah, it's great," he said, having yet to test it out. the board was borrowed and ridden by the whole gang. "That's how I made all my friends," he said, smiling. Visiting an old Florence skate park in the 1980s and hitting Florence Country Club's empty pool in the winter - or any empty pool, for that matter- are fond memories or Waters, but riding waves has always won out. "I love surfing more. It's my favorite things to do," he said. "I like dealing with the variables of the ocean." In 1976, Waters graduated from West Florence High School and went to pursue a business degree from the University of South Carolina. But he needed to fuel his passion and decided to take a break his sophomore year, heading to Lahaina, Maui, with some buddies. "We slept in the woods," he said laughing. "We stayed in a motel, but that got expensive, so we camped out." He surfed, worked at the pine-apple factory and reveled in the Hawaiian vibes. After earning a business degree in 1981, he ventured into the real estate realm along the coast just as a downturn in the market was causing a big slowdown. He noticed surf shops popping up, through, and saw an opportunity, opening the original Salty's in 1983 in ocean isle, north Carolina, where his family had a beach house. Racking his brain for a name, he thought of the family beach house, which was dubbed Salty Waters. "All I could ever come back to was Salty's", he said. The first few years were lean. "Quicksilver saved me," he said, referring to the board-shorts company had expanded its market share into a wildly popular clothing line with pants, jackets, sweaters, and hoodies. "It puts me on the map." The shop moved around a few times and he found himself oceanfront at one point, which was great, aside from how many young surf rats would show up between surf sessions. "I was dealing with a lot of hanging out," he said, laughing. Being solely dependent on three months of robust sales in June, July, and August was not an easy task, so he sold that shop. He returned to his routes, opening a Salty's Surf Shop at the old Florence mall right before the summer of 1985. His timing was solid, as skateboarding fever was sweeping anew across the land. he sold "an insane" amount of boards and skate gear, he said. "Glory years for sure," he said. "A lot of boards on layaway for Christmas." Salty's has moved around a few times, and about sixteen years ago, Waters opened a new shop in Columbia, which he sold in 2008. Eleven years ago, he found the perfect spot in Florence, taking over a Hoffmeyer Road building where furniture was made. 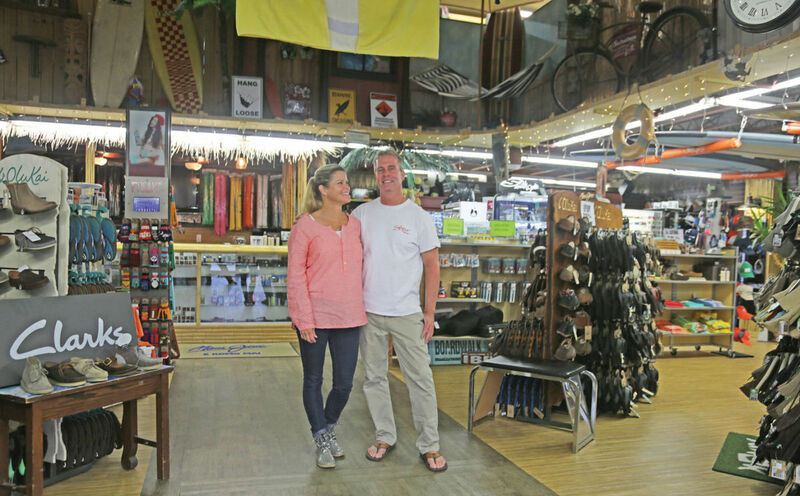 Scott Hemann renovated the 7,000-square-foot, two-story shop, installing a Tahitian beach motif. "He's unreal," Waters said. "He did a great job." With roughly 4,000 square feet of showroom space, Salty's is packed these days with everything one needs for board sports. Waters saw around a curve roughly 15 years ago when rainbow flip flops took off and has since stocked brands from Birkenstock and Crocs to Reef and Sanuk. "Shoes are the main thing right now," he explained. "Flip flops pay the bills." He sees woman as driving the business, and is ever mindful of trends, brands, and the next new thing. Watching what school kids want to wear has also kept him abreast of the latest fashion and lifestyle wear. "The what I call 'Southern lifestyle' brands are really what's going big right now," he said, referring to Fish hippie, Southern marsh, Coastal Cotton, Johnnie O, and Rowdy Gentleman, to name a few. "You have to follow trends; otherwise, you're set up to go out of business." A few years ago, Waters' son, Trevor, was offered a new spring wardrobe from Salty's; he demurred. "He said, 'I don't like anything you have,'" Waters said, shaking his head. "You've got to listen to the young people-kids in school and that's basically it. If the T-shirts sell, you know the (clothing) line will go." With 10 employees-half of those full time-Waters still logs plenty of cash register time and is helped by his wife of 24 years, Connie. "We're very blessed to have the diverse customer base that we do," she said. "They're very loyal, and we appreciate their business. We've now had the second and third generation come in, so it's great." Waters jokes that he and his wife have to keep working to put Kelsey, 21; Adrienne, 18; and Trevor, 15: through school, but they both love what they do, even if it means having to work most holidays when everyone else is off and relaxing. Of course, there is a huge upside to owning your own business. "If the waves get good, I can take off," he said. "Not gonna miss that."